SCVHistory.com HM6302 | Pink Ladies Assist Patients at Santa Clarita Hospital, 1963. 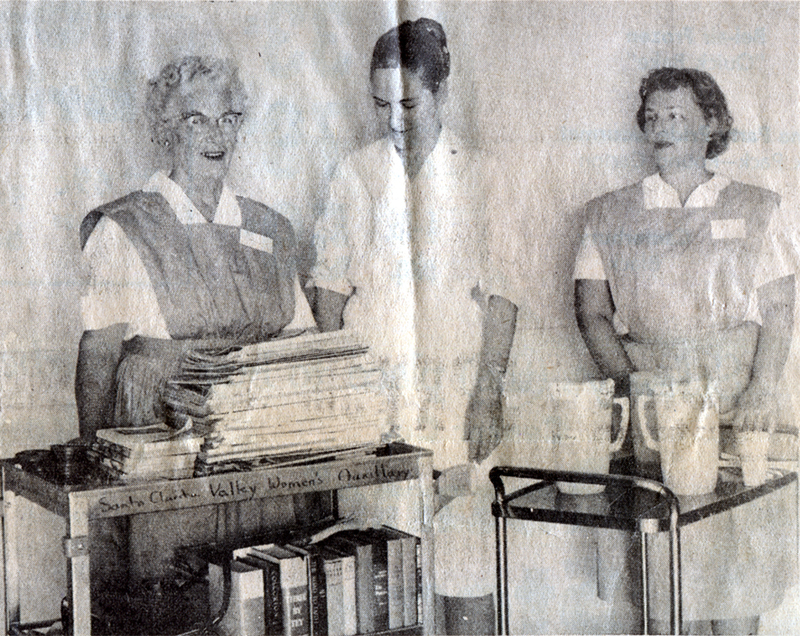 July 25, 1963: The newly organized hospital volunteers known as the Pink Ladies assist patients at Santa Clarita Hospital. Caption reads: "Pink Ladies Mrs. H.G. [Martha] Barton, left, and Mrs. Auby Lee, right, pause for a hallway visit with Mrs. Lena Huntsinger, assistant administrator of Santa Clarita Hospital. The book cart and juice cart are among the patient services offered by the Pink Ladies."